Our financial life in our 20s should not be similar to that in our 50s. Sure, some financial concerns are long-term and what we begin (or not!) in our 20s can certainly impact our lives later. But for the most part, each stage of life is characterised by different needs, worries and thus requires a different approach in terms of money management. Here we look at 4 main life stages and the financial decisions a Singaporean makes at each stage. As people hit milestones at different times, we’ve categorised the stages according to major life landmarks rather than age. Most Singaporeans enter the workforce in their early 20s, after completing their education. The financial decisions you make in this stage of your life can shape your financial future so it’s worthwhile to start on the right foot. Do you have a budget? Take control of your finances early by setting a budget. Figure out your fixed expenses, set aside a percentage of your income for your short and long-term financial goals, and then allocate the remainder for your lifestyle needs. Learning how to budget early on will set you on the right path to reach your money goals. Have you started saving? It can be tempting to indulge in luxuries and live the high life now that you’re earning your own income and are financially independent from your parents. But even while you enjoy having your own money, this is also the time to build a savings habit. You should aim to put aside 20% of your income as savings. A foolproof way to start your savings nest is to create a separate bank account (without an ATM card) just for your savings. When you start saving in your 20s, you have a much longer time horizon to let your money grow, thanks to the power of compound interest. Are you paying down your debt? If you earned your diploma or degree before entering the workforce, chances are you have a tuition loan to service now that you’ve graduated. It’s a good idea to review the terms of your loan and figure out what’s the best way to pay it off. If your budget permits, you should try to aggressively pay down your debt so as to minimize the interest accrued on the outstanding amount. The longer you take to pay off your tuition loan, the more money you lose — not just in interest payments but also the opportunity cost had you been able to save or invest that money instead. Do you have life insurance? You may think it’s too early to buy life insurance, but that’s a misconception. We recommend buying insurance as soon as you can. As premiums are lower for young people, getting life insurance in your 20s means that over the tenure of your policy, you get more out of it by getting full coverage for a longer period at a lower cost. Buying a life policy early while you’re still healthy can also help guarantee your insurability in the future. Once you’ve settled into your career, life changes. For most working adults, advancing in your career means earning more. With a larger financial cushion, perhaps your financial goals have shifted or you’ve developed new goals. Having a higher income may not necessarily translate to a better financial future, so it’s important to take stock and reassess your financial standing. What are your long-term financial goals? Instead of just living in the moment, take the time to formulate your long-term financial goals. It could be buying your first car, saving to buy a home, or accumulating a certain amount of savings. Having long-term goals can provide direction when you make decisions on how to spend and save your money. Have you started planning for retirement? Retirement may seem like a long way to go when you’re still building your career, but don’t let these high income years go to waste. Now is exactly the time to make plans for your golden years. While CPF savings are a good starting point, it’s advisable that you supplement your CPF with your own savings and investments. Look into financial instruments that suit your risk appetite and retirement goals. Life insurance may also be part of your retirement plan. Are you living within your means? For many, as their income rises, so does their expenditure. Unfortunately, that’s not the route to financial success. Be mindful of your spending even though you may be earning a high salary. Ideally, your monthly expenditure should remain roughly the same even if your income rises (assuming that your life situation doesn’t change). That way, any additional income can be funneled towards reaching your financial goals. Do you have enough emergency funds? Having emergency funds set aside can provide you with a buffer in case any unexpected expenditure arises. It’s recommended that you should have anywhere between three to six months of your income saved as emergency funds. An emergency fund can not only provide peace of mind, it can ease your financial burden in times of stress and difficulties without you having to dip into your savings. The transition from singlehood to marriage to family life brings a multitude of changes. Aside from the emotional aspect, getting married and starting a family also involves financial commitments. Don’t let money be an obstacle during this life stage. With some planning and financial savvy, you can navigate this time in your life with less stress and worry. Are you ready to own a home? For many Singaporean couples, buying their home — perhaps a BTO — is one of the first major financial commitments they make together. When buying your first home, it’s important not to overextend yourself. You should buy a home that you can afford. Remember, a mortgage is a long-term commitment. Buying a home that is outside of your budget will inevitably lead to financial stress. Are you financially ready to have children? Having children is said to be life’s greatest joy, but it can also be very expensive. As such, consider the costs of raising a kid before you have one so that you can be ready for the financial aspect of starting a family. How do you know if you’re financially ready? Our guide provides some tips to help you figure this out. Do you have sufficient life insurance? This life stage involves growing the circle of your immediate family, and that’s why it’s important for you to review your life insurance coverage. What might’ve been sufficient in your single years may be woefully insufficient now that you have a partner and children to think about. Getting married and starting a family should drive you to reassess the financial protection you have in place for your loved ones. Not sure how much life insurance is enough? Here’s a simple way to calculate your life insurance needs. Do you have enough funds to take care of your dependents’ financial needs? As your family grows, so do your financial obligations. On top of your kids and partner, you may also be supporting your parents. 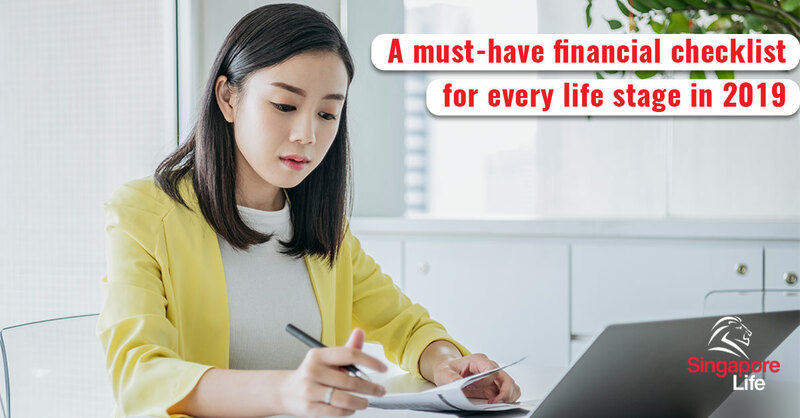 This is a good time to review your budget and cut down on any unnecessary expenses so that you can take care of the immediate financial needs of your dependents. You may also want to consider their financial future. This is where life insurance coverage can play a big role in ensuring that your loved ones will have financial resources should anything unexpected happen to you. Some parents may also wish to give their children a financial head start by starting a savings nest for them or setting aside funds for their future education needs. As you move into the later stages of life, it becomes more about preserving what you have and ensuring that you have enough money in your old age. Upon reaching your golden years, achieving self-sufficiency should be your main goal. Here are four things to consider in this stage of life. 1. Have you paid off your housing loan? Without employment, it would be a financial struggle to service your debt repayment and account for daily living expenses. Ideally, your mortgage should be paid off before you retire. 2. Should you downgrade your home? For many Singaporeans, monetising your flat is one way to boost your retirement finances. You may want to consider downsizing to less expensive and smaller home and put the profits from the sale of your home into your retirement account. 3. Do you have a retirement income stream? For your retirement years, low-risk investments and savings instruments are your best bet as they can help grow your money while keeping the capital relatively safe. One option to consider is short-term endowment plans. These plans can protect your principal amount while earning a return that is higher than a normal savings or fixed deposit account. 4. How are you spending your retirement funds? As your monthly income during your retirement is likely to be lower than your working years, a lifestyle adjustment may be necessary. It pays to be mindful of how you’re spending your money, so that you don’t run out of funds. Try to find ways to cut your spending, and don’t be embarrassed to take advantage of discounts and promotions available for seniors!